Since ages, it is a belief that people always find ease in all means of life. It is, in fact, human nature. When it calls for loans and debts, there is a variety of ways to take loans. The most common way is through banks. Banks are the best legal mode of taking loans. But banks processing, rules and policies and much time consuming, hectic and difficult. People try to avoid such time taking processes. Some private companies are also working on debts and loans. Above all, these banks and firms are full of legal contracts and policies. On the other hand, there is another way of taking debt. This is most easy and free of legal contracts. We can take money from our close friends or relatives. This way of taking debts is commonly used when people do not need big amounts of debt but for little financial operations. In such cases, we just need a debt acknowledgment letter. These letters are only a type of guarantee or proof to the creditor that debtor will return the amount. In these letters, it is important to mention the name of the debtor, creditor. The date of returning must be mentioned. The signature of the debtor is a key factor. In worst cases, such letter is a proof for filing any case against the debtor regarding declination to return. 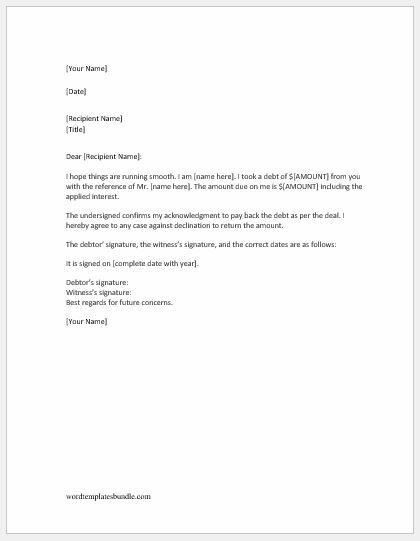 The following letter can be used as debt acknowledgment or I owe you letter as a proof to the creditor. I hope things are running smooth. I am [name here]. I took a debt of $[AMOUNT] from you with the reference of Mr. [name here]. The amount due on me is $[AMOUNT] including the applied interest. The undersigned confirms my acknowledgment to pay back the debt as per the deal. I hereby agree to any case against declination to return the amount. It is signed on [complete date with year]. Best regards for future concerns.